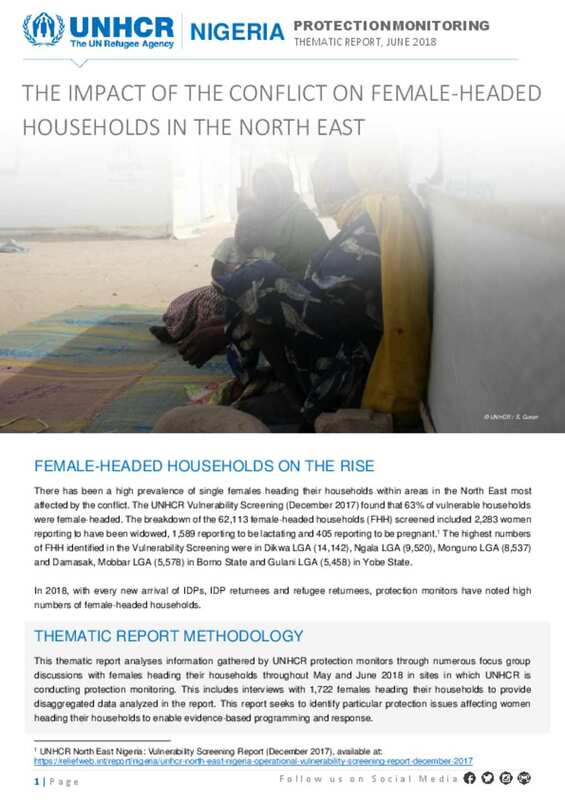 There has been a high prevalence of single females heading their households within areas in the North East most affected by the conflict. The UNHCR Vulnerability Screening (December 2017) found that 63% of vulnerable households were female-headed. The breakdown of the 62,113 female-headed households (FHH) screened included 2,283 women reporting to have been widowed, 1,589 reporting to be lactating and 405 reporting to be pregnant.1 The highest numbers of FHH identified in the Vulnerability Screening were in Dikwa LGA (14,142), Ngala LGA (9,520), Monguno LGA (8,537) and Damasak, Mobbar LGA (5,578) in Borno State and Gulani LGA (5,458) in Yobe State.